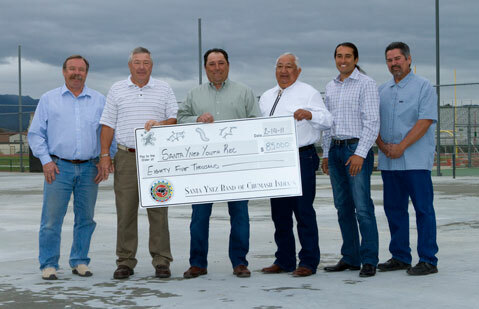 Pictured left to right: Bob Voorhis and Frank Kelsey on behalf of Santa Ynez Valley Youth Rec, Santa Ynez Band of Chumash Indians Chairman Vincent Armenta, Vice-Chairman Richard Gomez and Business Committee members Ken Kahn and Gary Pace. The Santa Ynez Band of Chumash Indians Foundation has generously donated $85,000 to the Santa Ynez Valley Youth Recreation. The funding will cover half of the refurbishment costs of the Santa Ynez High School tennis courts. In existence since 1955, the Santa Ynez Valley Youth Recreation organization raises money through the annual Elks Queen campaign and has provided funding for a large majority of the recreational fields located in the Santa Ynez Valley including the Sunny Fields Park and Pony League Fields. Youth Rec is also responsible for the original tennis courts at the high school that were built more than 25 years ago.